Both Halloween and Election Day are just around the corner. Why not capture the excitement of both events by having a candy election? Elementary school students should enjoy making posters and writing slogans for their favorite candy treat. Since there are so many different kinds of candy, you could have primary elections to select candy candidates. Or you can simplify the process and offer three choices. The important thing is to get students thinking about what goes into a campaign and attracting voters. It takes more than artwork, it takes poetry in the form of slogans. How do you describe the best qualities of your favorite candy? 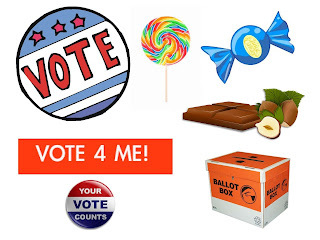 Can you write 5 to 10 reasons why your candy will improve the life of voters? What promises can your candy make? What can you write that will persuade someone to vote for your candy? You could even have a debate between candy candidates. One group could write questions and another group could prepare answers. A classroom of 25 students is the perfect environment for demonstrating the importance of each ballot. A single vote may win the election or there could be a tie, requiring a runoff or coin toss. Voting is a civic duty. It is never too early to explain the process and to get your students excited about voting.